Unlimited amount of sessions to help you get back into shape. All LUNCH-TIME BOOT CAMP sessions are conducted indoors, Monday to Friday at 12.10PM-12.40PM. Liberty Fitness Indoor Lunch-Time Boot Camp takes place at Liberty Fitness Health & Fitness Facility, 544 Mt Alexander Rd, Ascot Vale. It is something like you have never seen before. 30 minutes of super high intensity work out that will help launch your fitness into the stratosphere! Designed for those who may be on a time restraint, this is going to knock your socks off, and will keep you charging with energy for the rest of the working day! Lunch-Time Indoor Boot Camp is guaranteed to get you results, fast… With specially designed classes that that is specifically designed to melt fat, and increase muscle, there is no other Boot Camp quite like this. All classes are indoors, so there is no chance of your class being cancelled due to poor weather, EVER. If you are in Melbourne, and looking for the ultimate lunch-time boot camp, and getting soaked by the rain isn’t your ideal training environment, you cant go past the Liberty Fitness lunch-time boot camp experience. Classes are run Monday to Friday, at 12.10pm every day. All the people who train with the Liberty Fitness Indoor Boot Camp have answered ’YES‘to one or more of the following questions. Would you love to shed a few kilos? Do you feel you’re not getting anywhere with your exercise programme? Would you like all round advice on nutrition and exercise? …and what are the Boot Camp members get from Liberty Fitness Lunch-Time Indoor Boot Camp? To start with, they have fantastic fun, whilst getting awesome results amongst great people doing something that gives a real sense of achievement!!! They have all seen increased levels of fitness, healthier bodies, weight loss and toning. They are also see improved moods, more energy, better work performance, higher self esteem, more exercise and nutritional knowledge. All of this from just a 30 minute workout! Want 2 FREE Movie Tickets? 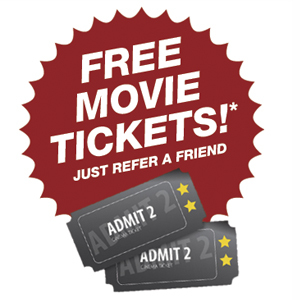 If you are a member and refer someone to join, you get 2 FREE Movie Tickets, it’s that easy!